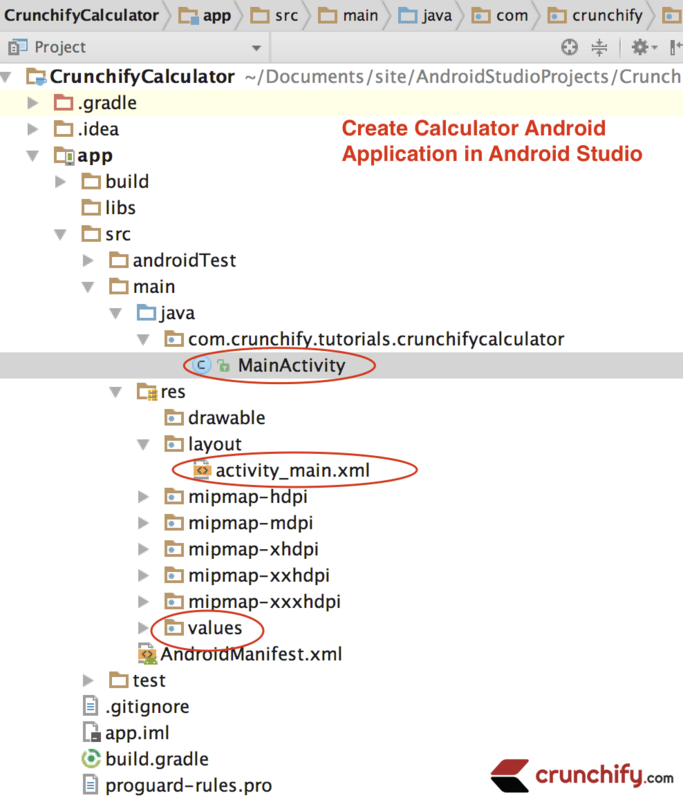 In my previous article I wrote detailed steps on How to create a simple android application. In that particular app I also explained concepts of android button and basic concepts of android. You can find all my other articles in Android section. 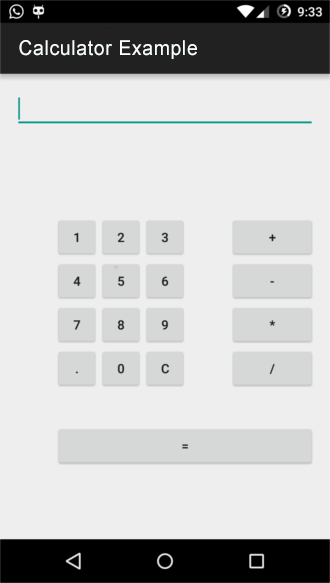 In this article we will create a calculator android app. This is a simple calculator with limited functionality. 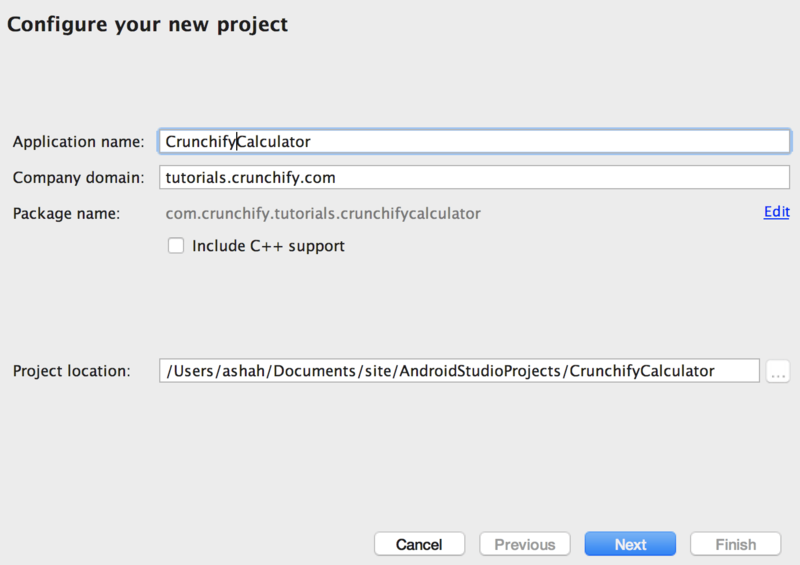 Give your Application Name CrunchifyCalculator and leave other fields blank as it is, then click NEXT. Select the Minimum SDK API 15: Android 4.0.3(IceCreamSandwich). I selected API 15 (IceCreamSandwich) because it covers almost 94% device and it has almost all the features. If you want to cover 100% device then you can select API 8: Android 2.2(Froyo). Select the Empty Activity and click NEXT. Leave the activity name MainActivity as it is and leave everything as it is. Click Finish. After clicking Finish, it takes around around ~2 minutes to build Activity and files. Here is a final project structure for your application. Now we have to add our Java code in our MainActivity.java file. You can find the explanation of highlighted line below the code. Here we have 1 EditText. It defines the type of content. Let’s understand code little-bit more. Line 11 – 14: Here we created the reference of Buttons and EditText. Line 16: Here we created two float variable for as value1 and value2. Line 21: We override the method onCreate() which is the method of Activity class. Line 45 – 50: We set onClickListener on Button1. If we click on Button1, EditText will display. We have implemented the same logic for every button. Line 115 – 127: Here we have set the click listener on Add button. Here we put the condition as, if we EditText is Null then we set EditText as empty value. Else we add the two value which are clicked before add button clicked and after add button clicked. We also set the crunchifyAddition Boolean value to True. This true represent that add button is clicked and this will be used when user click “=” button. We implement the same logic for other buttons also like buttonSub, ButtonMul, buttonDivision. Line 156 – 183: Here we set clickListener on “=” button. Here we put condition like if user click Add button the crunchifyAddition value is set True on the click listener of Add button. According to that, corresponding action will be performed respective to button clicked. if Add button is clicked before the “=” button then Add action will be performed as you can see above. After the action performed, we set the crunchifyAddition value to false, so that we can perform Add action again. 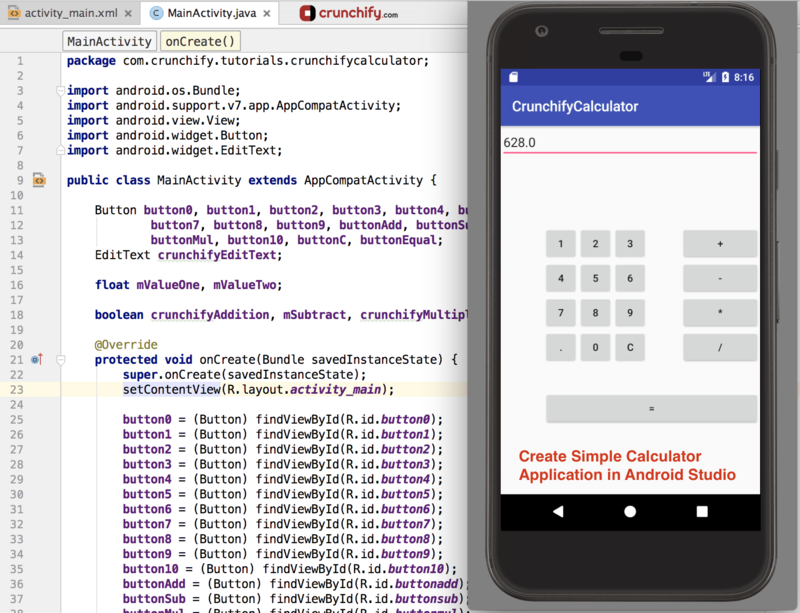 Now, all things should works fine and we are ready to run our calculator android app. To run our app I used my mobile, you can use emulator or your device. Click on Android device manager. After selecting your custom device in Android device manager window, click START. Choose Your device or emulator and click OK.
Now you can see calculator android app running as this screenshot. Congratulations!! If you have followed all steps and reach this point means you have followed all the steps correctly and your Calculator android app is up and running fine.